The artwork design for envelopes tends to follow from your Letterhead, Business Cards and Compliments Slip design. As with Letterheads, Business cards and Compliment Slips it is important that Envelopes are professionally designed and printed. It could be your client’s first point of contact with your company and so constructs in their minds an image of what your business is all about. C4 (324 x 229 mm) to take an A4. 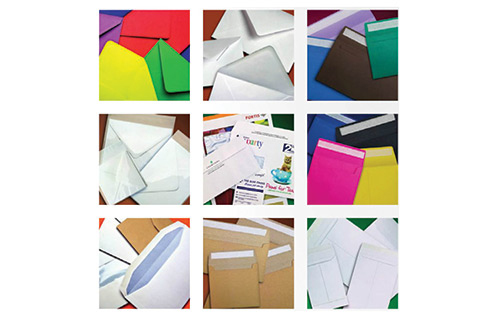 Envelopes are usually constructed of a quality paper like Conqueror 120gsm or a quality bond and can be plain or with a window. We print in black, specific corporate colours or full colour. FAST – We can design and print envelopes in 2/3 days. LOCAL – We can visit clients’ business premises at short notice. Free local delivery is part of our service - or you can collect from our centre in Clarence Street. We have a car park for customers’ use behind the centre. PERSONAL – If you need further advice on envelopes please give us a call (0800 999 KWIK – easy to remember and free!) - we are very friendly, helpful, techno-savvy and professional.